New York Rangers President and General Manager Glen Sather announced today that the Rangers have acquired defenseman Matt McCue from the Anaheim Ducks, in exchange for forward Tomas Zaborsky. 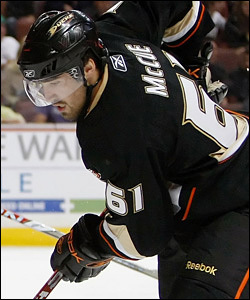 Defenseman Matt McCue saw preseason action with Anaheim in 2009 before spending the 2009-10 season with Ducks affiliates in the AHL and ECHL. McCue, 22, split the 2009-10 season between the Manitoba Moose of the American Hockey League (AHL) and the Bakersfield Condors of the ECHL. He began the campaign with Manitoba, registering one goal and 24 penalty minutes in 10 games. McCue made his professional debut with the Moose on October 3. He notched his first professional point with a goal on November 2 vs. Norfolk, tallying Manitoba’s only goal in a 3-1 defeat. McCue made his ECHL debut with Bakersfield on January 13 at Ontario following his assignment on January 7, and recorded two assists and 68 penalty minutes in 19 contests with the Condors. He registered an assist in back-to-back contests on March 20 vs. Victoria and March 26 at Utah. His assist on March 20 was his first professional assist. Prior to turning professional, the 6-5, 220-pounder skated in 247 games with the Spokane Chiefs, Chilliwack Bruins, Brandon Wheat Kings and Medicine Hat Tigers of the Western Hockey League (WHL), registering 15 goals and 48 assists for 63 points, along with 625 penalty minutes. McCue established career-highs in goals (six), assists (19), points (25) and penalty minutes (195) in 2008-09 with Brandon and Medicine Hat. He also recorded two goals and two assists for four points, along with 38 penalty minutes in 20 career WHL playoff contests with Chilliwack, Brandon and Medicine Hat. The Cochrane, Alberta native was originally signed by Anaheim as a free agent on December 30, 2008. Zaborsky skated in 41 games this season with Assat Pori of the Finnish Elite League, registering nine goals and 17 assists for 26 points, along with 67 penalty minutes. He was originally selected as the Rangers’ fifth round choice, 137th overall, in the 2006 NHL Entry Draft.